What Is The Difference Between Wastewater Screening And Filtering? The importance of water treatment is an ongoing issue when it comes to public health and safety. Water treatment facilities and their equipment are used across the country to treat, or to remove the harmful properties from it. This is generally done by wastewater treatment plant facilities, whether publicly or privately operated. Wastewater, which is comprised of anything from toilet flushes, sinks, dishwashers, washing machines, or from industrial, commercial, or agricultural runoff. Since it can contain chemical pollutants, it is most necessary that it be treated for safe use and consumption. Facilities that clean wastewater, such as water treatment centers clean it before discharging it back into the environment. This is done through a multi step process. Let’s explore this process further. Wastewater Screening is the first unit operation used at wastewater treatment plants (WWTPs). Screening removes objects such as rags, paper, plastics, and metals to prevent damage and clogging of downstream equipment, piping, and appurtenances. There are different types of wastewater screens which include coarse screens, fine screens, and communitors and grinders (which are typically used at a smaller treatment facility). Screens can be made of a simple trash rack, or can be as complex as a mechanical bar system. There are also hydrocyclone systems which are devices used to separate liquids from solids, or grit from sludge, directly from the wastewater. The EPA identifies the specifications below for the varying types of screens. Coarse screens remove large solids, rags, and debris from wastewater, and typically have openings of 6 mm (0.25 in) or larger. Fine screens are typically used to remove material that may create operation and maintenance problems in downstream processes, particularly in systems that lack primary treatment. Typical opening sizes for fine screens are 1.5 to 6 mm (0.06 to 0.25 in). Very fine screens with openings of 0.2 to 1.5 mm (0.01 to 0.06 in). Another mechanical screen component are comminuting and grinding devices (which consist of rotating slotted cylinders) are installed in the wastewater flow channel to grind and shred material up to 6 to 19 mm (0.25 to 0.75 in) in size. There is also hydrocyclone systems. This is a system that separates liquids from solids directly from the wastewater. Heavier grit and suspended solids collect on the sides and bottom of the cyclone, while scum and lighter solids are removed from the center through the top of the cyclone. Wastewater filtering is another step in the process of the water treatment process. In order to safely consume water for drinking, for example, the wastewater needs to have dangerous contaminants reduced below EPA limits. To treat the water secondarily (after screening), a filtration process is used. The type of filtration system that is used depends on the facility, but a trickling filter system (also known as activated sludge process) is often used. In this process, wastewater is pumped into an area that has about the to six feet of stones, essentially into a tank that is aerated so it will produce the growth of bacteria. On these stones, bacteria attaches to its surfaces, and then the bacteria consume and break down the matter that passes through the area. The bacteria are responsible for breaking down the organic matter among the sludge that flows into the tank. Afterward, the water goes through an additional round of treatment. After the water leaves the sedimentation tank in the secondary stage of the treatment process, it is sent into tanks where it is exposed to chlorine (or ammonia), which can kill up to 99% of the bacteria. This is, of course, a very important step in the process. Don’t forget that there are also water filters that can be purchased for your business or home, that come in a myriad of shapes, sizes and costs. Water filters are available to support a home’s principal water resource, to attach or connect to a faucet, and they are even available for an individual water bottle, too. Water filters can be stationary or portable, depending on your usage (bathrooms, swimming pools, drinking water). While filters are an excellent resource, they do need to be maintained over time — just as equipment and a water facility does. This might have given you a better idea of the way a water filter can be used. Now that you have this image, you can see that in the wastewater treatment process the screening is really the preliminary step that removes ‘larger’ organic matter, and then the filtering process is one that further removes any impurities. The wastewater screening and filtration process are crucial for creating and maintaining water that is safe for human use and consumption. There are various kinds of technology used for this process, but you can imagine that a degree of efficiency and reliability ensure the process runs seamlessly. Since water is among — if not THE — most precious resource, we must use high quality materials and a consistent, responsible process for treating it. Water at its natural state contains undesirable sediments, colors, algae and other organisms that can be harmful. For these reasons, water treatment is a process that is paramount. To keep water treatment processes pure, equipment such as tanks, filter bed and other work areas must be clean and maintained properly. They must follow the Environmental Protection Agency’s regulations and ensure the highest standard of safety it met. When it comes to our health and safety, you want to be able to trust the screening and filtering processes that purify our water. Lakeside Equipment Corporation uses high quality materials and designs that have been engineered specifically for this process. Contact Lakeside Equipment today to find out more about how we can help you with your water treatment needs! Wastewater is one of the most common forms of pollution, and in the United States there are wastewater treatment facilities to control this. According to the Environmental Protection Agency (EPA), wastewater contains large solids and grit that can interfere with treatment processes or cause undue mechanical wear. Over time, this increases maintenance on wastewater treatment equipment. In order to minimize problems, these materials require separate and special handling and maintenance. The EPA recognizes preliminary forms of wastewater treatment as screening, grit removal, septage handling, odor control, and flow equalization. Facilities that clean wastewater, such as water treatment centers clean it before discharging it back into the environment. This can be done with machinery (both manual and mechanical). Machinery that has been especially engineered for wastewater treatment is most efficient. Let’s take a deeper look at some of the ways wastewater screening works. In general, wastewater screening devices are classified based on the amount of material that is being removed from them. The design elements that classify screening equipment are size, depth, width, the screen’s angle, approach velocity of the channel, the discharge height, wind and other aesthetic considerations. There are different types of screening devices, both manual and mechanical. Coarse Screens – Coarse screens remove large solids, rags, and debris from wastewater, and typically have openings of 6 mm (0.25 in) or larger. Fine Screens -Fine screens are typically used to remove material that may create operation and maintenance problems in downstream processes, particularly in systems that lack primary treatment. Typical opening sizes for fine screens are 1.5 to 6 mm (0.06 to 0.25 in). Very fine screens with openings of 0.2 to 1.5 mm (0.01 to 0.06 in). Hydrocyclone Systems – This is a system that separates liquids from solids directly from the wastewater. Heavier grit and suspended solids collect on the sides and bottom of the cyclone, while scum and lighter solids are removed from the center through the top of the cyclone. There are both manually cleaned and mechanically cleaned bar screens. A bar screen is essentially a heavy duty screen that uses a reciprocating rake which cleans the wastewater bar screen by pulling out debris. In general, manually cleaned screens will require frequent raking to avoid them getting clogged up. This also avoids a buildup of solids on the screen itself and backwater levels from rising. Keep in mind that this manual work will require more labor costs over time. The time that is taken to clean the screen manually will also detract from the time it is serving its purpose, which can also cause overflow of waste solids. Mechanical screens, on the other hand, aren’t subject to the same concerns, but they do require higher maintenance costs. Overall, you want to make sure you have a system that is the most efficient for your facility and needs. The Environmental Protection Agency suggests that plants utilizing mechanically cleaned screens should have a standby screen to put into operation when the primary screening device is out of service — which is a standard design practice for many newly designed plants. Having a replacement screen will prevent clogging and backup, similarly to concerns for when a manual screen is being cleaned. Larger facilities are more likely to use a mechanical screen in order to reduce labor costs (as the equipment is more costly itself), and to improve the conditions of the overall flow of the wastewater and water treatment process. The cost for screens varies, of course, depending on the technology that is used and that is available in each particular area. When considering a wastewater treatment system, you want to select one that is appropriate for your needs. Keep in mind your location, facility, anticipated costs, the size of the system, and its overall functioning. One of the most important components of a water treatment system is the screen. As discussed, screens come in different sizes, depths, widths, and different designs according to the technology available in the area as well as for your budget. Overall, mechanical screens are commonly used in larger treatment facilities and require lower labor costs. No matter what type of equipment you choose, it is important to have a backup screen so your operations can run smoothly, avoiding backup and unnecessary problems. If you are looking for a water treatment system, take a look at our specially engineered equipment with quality materials which has been made to maximize efficiency and minimize setbacks. What is grit collection technology? Before you can think of that, you have to think about grit. Grit is the fine particles of matter like sand, sludge, and other abrasives found that finds its way into sewers and septic tanks or that comes from rivers, lakes, and streams. Wastewater grit is especially troublesome. It’s more than sand. It can be eggshells, bones, and coffee grounds that go down the sink. It can be the sand and gravel that washes from a street into a sewer drain. These materials are never a consistent size or shape. Now think about the industrial settings and treatment plants that encounter grit in water or other liquids. Not only can they clog equipment, but the abrasive materials wear down parts over time. It gets costly. Grit collection technology is the equipment and processes that clear grit and other particles from water before it’s used in industrial or residential settings. How Does a Wastewater Treatment Plant Clean the Water? 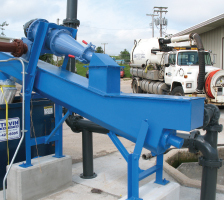 Wastewater treatment plants use grit collection technology every day. Not only must these plants remove odors and bacteria, but they also need to take the wastewater and make it clean. This is a multi-step process. A screw pump controls the rate at which water flows. Bearings are important to the screw pump’s lifespan, so you want quality components. Lakeside Equipment has engineers that look at the lift and flow rates you need, and consider those with the incline and required speed in order to develop the ideal pump for you. Screens filter all large materials like paper towels, plastic wrappers, and toilet paper to prevent damage to pipes and avoid clogs. As wastewater continues through the equipment, the screens get smaller and smaller. Screens may start with gaps of 1.5 mm and go as small as 0.06 mm. To clean the screens, there may be a trash or screen rake that automatically clears and removes the debris. In between the different screen sizes, there are grinders that grind the waste. The idea is to keep grinding the waste and catching it in filters until the water that passes is clean. There are also comminutors that capture the large material and chop it into more uniform sizes for the grinders to work with. Grit chambers and grit collectors are the pieces of equipment that collect the grit so it can be taken to a landfill or facility for disposal. To get to the cleanest water possible, you need a system that effectively filters out silt and other particles. These steps are all part of the basic process. There are several systems available, and each works a little differently depending on the components you choose. Lakeside Equipment Corporation specializes in several types of grit removal systems. There are advantages to each one. Aeroductor – The Aeroductor system avoids having any motorized parts that are submerged. It can be constructed from stainless steel to prevent corrosion. Its biggest benefit is that it can separate and wash grit at the same time. Headworks Packaged System – H-PAC systems are stainless steel and prevent corrosion. It has by-pass options for the grit chamber and screen. Grit Classifier – There are several types of Grit Classifier systems to allow you to find the best solution for your needs. A screw conveyor gets rid of grit that is ready to be disposed of. That screw conveyor is designed for strength and durability. In-Line Grit Collector – In-line is an affordable system that uses aeration to keep particles from settling. 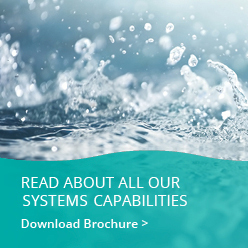 It’s best for a system where the flow rate is under 6.0 million gallons per day. Motorized parts remain above water for easy maintenance. Raptor – If you need a grit removal system that has a conical design where grit and particles are washed and separated with precision, the Raptor Grit Washer is a good choice. It’s made from stainless steel to help prevent corrosion. It handles a variety of flow rates and reaches grit discharge rates of 90 percent. SpiraGrit – With SpiraGrit, you get a compact system that doesn’t take up much space. The bearings are not submerged and the components do not corrode quickly, which makes maintenance a breeze. It handles all flow rates. Whether you’re replacing equipment or planning a new system, you need to carefully weigh the water flow rates, longevity, and requirements. Experts can help you decide the best grit removal technology for an efficient, effective treatment system. Would you like more information on equipment that helps with grit removal? Use the online form to get help finding the right system for your needs. You can also call (630) 837-5640.